The S'ip by S'well Blueberry Burst Travel Mug from designer bottle creators S’well brings colour and fun to the world of reusable travel mugs. 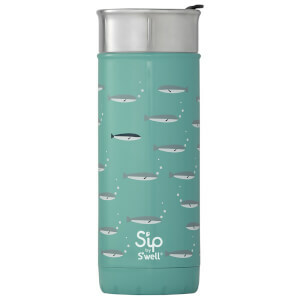 The pale blue design is beautifully adorned with juicy blueberry images and is topped with a stainless steel, leak-free lid with a flip top for one-handed, comfortable sipping. Perfect for keeping your coffee hot on the school run or when travelling to work, the mug is constructed from insulated double walled stainless steel to keep your drinks hot for up to 12 hours and cold for up to 24. The leak-free, condensation-free, reusable mug will keep your drink at its optimum temperature all day long; while reducing your use of single-use takeaway coffee cups. Dimensions: H: 20cm x Ø: 7cm. Capacity: 470ml/16oz.